MasterCard has rolled out a campaign promoting its sponsorship of The Brit Awards, offering consumers the chance to duet with their favourite artists. The 'Priceless Duet' campaign, which launched today (10 January), invites consumers to enter a competition with the winners performing with one of singer Labrinth, boyband JLS or this year's Choice Award winner, Emeli Sande. 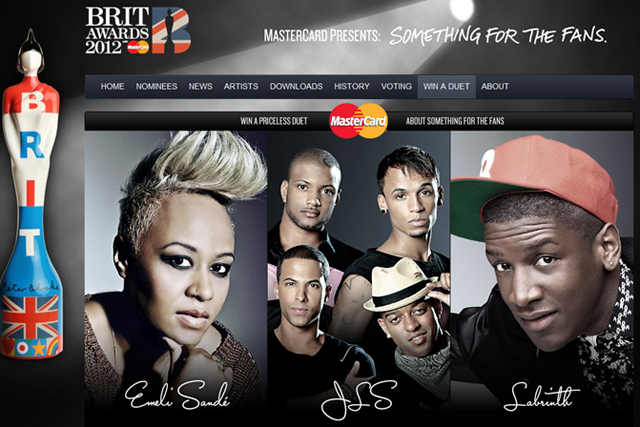 The winners will be shown performing on a TV ad, to be broadcast on the evening of the 2012 Brit Awards on ITV1 on 21 February. Music fans are invited to load up audition tapes at the campaign website, www.somethingforthefans.co.uk. The campaign will be supported with print, digital and social media activity. Shaun Springer, head of brand and sponsorship, MasterCard UK & Ireland, said: "MasterCard is evolving from a brand that celebrates 'Priceless' moments, to one that enables 'Priceless' experiences, thereby bringing additional benefits to choosing to use MasterCard and building further emotional engagement with consumers. "'Priceless Duets' gives music fans the opportunity to meet and perform with top British music talent, which we believe is truly priceless. "Social media engagement will be important for this campaign and we will be maximising both our own channels and those of participating artists and their fans, to engage and excite consumers around the competition." In September, MasterCard relaunched its long-term 'Priceless' marketing campaign with city-wide rewards programmes, claiming to offer exclusive "experiences" through partnerships with hotels, museums and restaurants.